The North Fork Of The Sacramento River Descends Into The Unknown. 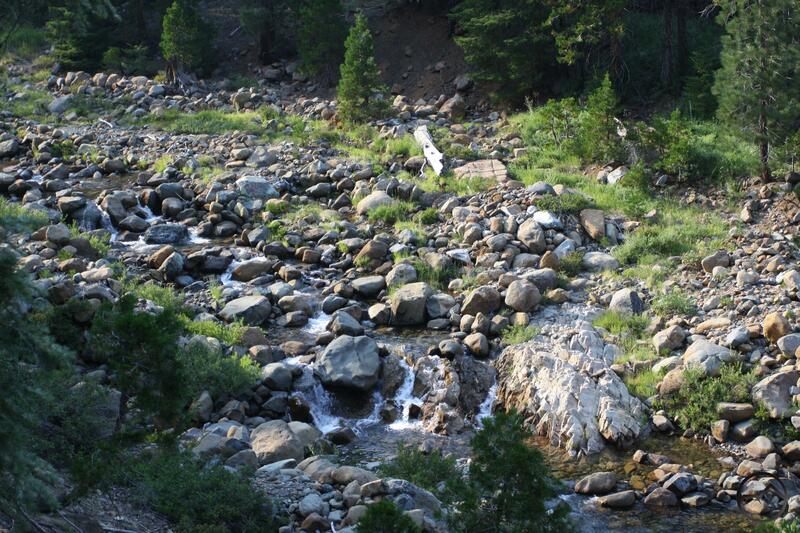 Few trails in the Mount Shasta area have the aura of mystery that surrounds the Sisson-Callahan Trail (SCT). At one level it is something of an enigma on account of its extremely light use. Compounding this, there is a general paucity of information on the trail. 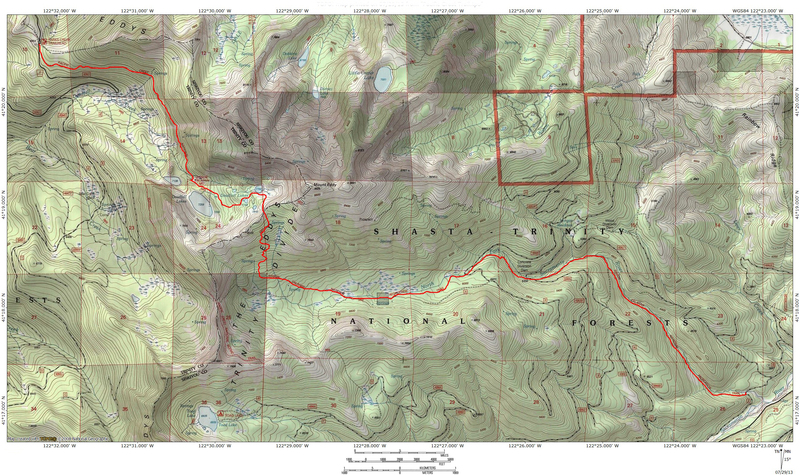 Hikers looking for beta on the trip are bound to be stymied (until they stumble upon the SCT page on Hikemtshasta, of course) and must commit to the long trail with little preparation but a few brief descriptions, some of which are inaccurate, and a map of the trail. Yet, the lack of good information on the trail and the fact that the SCT is nearly forsaken by hikers is not the only reason for the enigmatic cloud that seems to hover over the trail. The very course the path charts imbues it with a sense of secrecy. 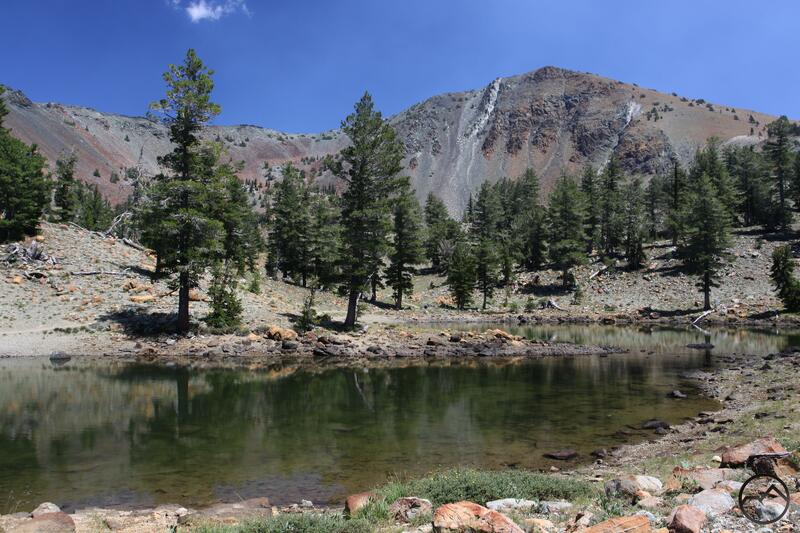 The trail begins in the open, sunny heights of the Deadfall Lakes Basin and then descends into, to borrow Joaquin Miller’s description of the woods around Mount Shasta, the great black forest of California. It is a passage from height and light into depth and dark. But it is a grand and varied journey. Mount Eddy reigns high above the Deadfall Basin. Perhaps the SCT is cast in obscurity in part because its more distant, higher trailhead is inaccessible by car. One must hike a few miles on the Pacific Crest Trail in order to reach the western terminus of the SCT. This section of the PCT is generally not obscured by trees and is bathed in light, with far reaching vistas of the Trinity Alps and the cardinal crest of the Scott Mountains. Upon arrival at the beginning of the SCT on the outskirts of Deadfall Basin, the crimson cliffs begin to encircle the trail, wildflowers greet hikers merrily and the lakes wait to refresh trail-worn. The multi-hued tower of Mount Eddy, characterized by a tall, ragged cliff, oversees this wonderful mountain fastness with a brooding presence. 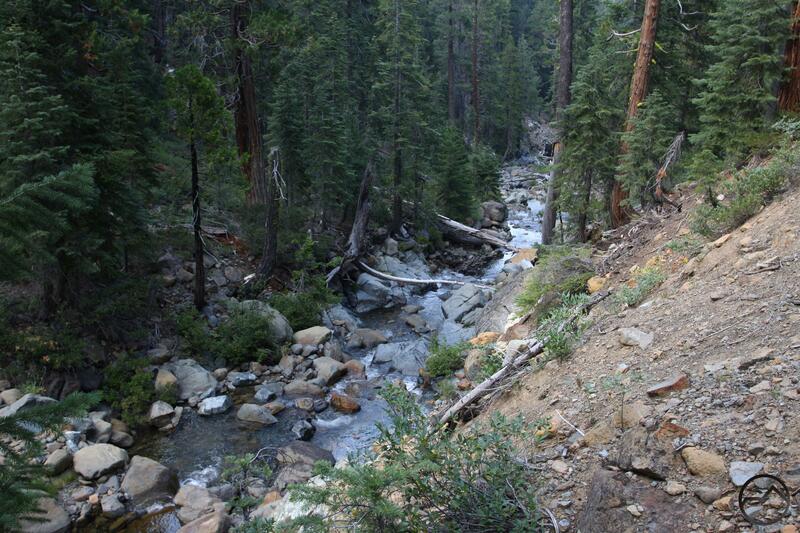 From the glorious vantage at Upper Deadfall Lake, the SCT makes a swift climb to the rim of the basin. Hikers bound to follow the SCT are joined here by those heading to the summit of Mount Eddy, so the path is not a forsaken one. However, at the crest of the basin’s rim, the Deadfall Lakes Trail turns left, and continues to the summit of the mountain while the SCT is truly the road less traveled. Those who choose this path now begin the great descent into a seemingly unknown land. 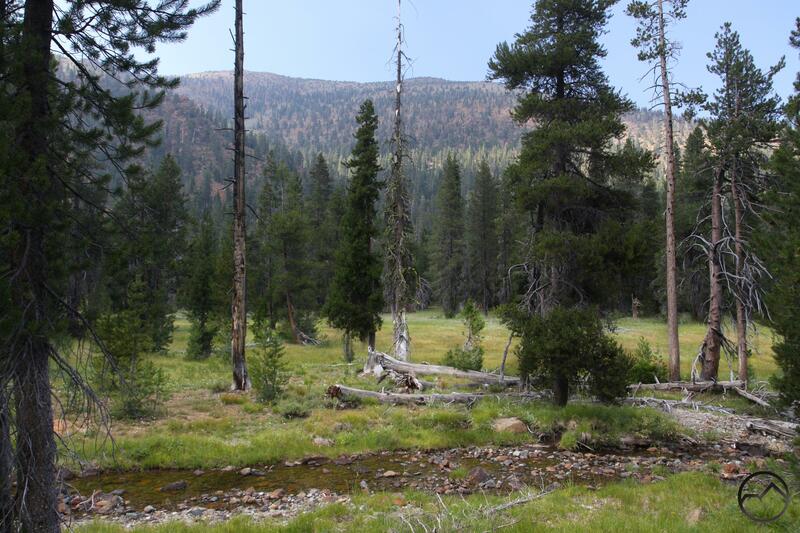 The North Fork flows through the meadow complex. 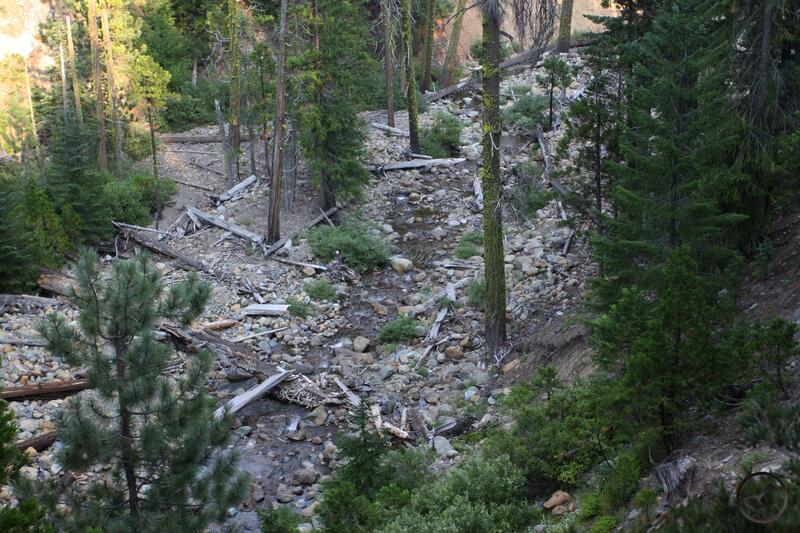 After having climbed out of the Deadfall Lakes Basin, the nature of the SCT changes immediately. What was once a broad, well-traveled trail becomes a narrow, lightly used path. Though the condition of the trail is the first inkling that the SCT has now become a journey into an enigma, it is quickly accompanied by a loss of grand vistas. Though the Castle Crags, the Trinity Divide and the Lassen area are visible briefly, the clarity afforded by the first few steps of the descent is lost to the marvelous trees. These ancient denizens of the North Fork of the Sacramento River’s canyon are large, lovely and unusual, especially the out-of-place foxtail pines. As the trail nears the bottom of the canyon, it turns east and enters a fantastic meadow populated by clusters of lodgepole pine. Unlike earlier meadows and grassy areas, the views from this collection of meadows are clouded by the presence of countless trees. Still, light filters through and the area can be sunny and the red flanks of Mount Eddy are visible at times. As one continues to the east, the trail passes in and out of meadows, through the trees and stays very close to the path’s now constant companion, the North Fork of the Sacramento. As the canyon deepens, the forest grows thicker and views are eaten away, the river remains constant, a guide through the heart of the great black forest that waits ahead. The North Fork leads through the dense forest. Finally, the last vestiges of the meadow are consumed by the forest and the river, once a playful stream laughing its way through grassy banks, transforms into a racing, crashing river. It cascades over boulders and fallen trees, only standing still long enough to gather itself in pools below cataracts before surging over more boulders. The forest itself has finally pressed in, closing off all but the immediate channel of the river. The views are gone and all that remains to link the hiker to the world beyond the dense woods is the river itself. Still, the forest has a deep, primeval beauty, even though it casts a pall of mystery over the canyon. There are hidden sites around this canyon but an accurate understanding of the area is necessary to be able to pierce the wall of trees and find them. Eventually, even the beauty of the forest is worn away and the final leg of the hike is a long push down to the North Fork trailhead. At the very end, the woods finally recede, pushed back as the river widens. The light returns and hikers are refreshed by the crossing of the river as they make the final steps to the end of the journey. The SCT is a beautiful trail but it is shrouded in enigma. Little has been written and few claim to have made the whole journey. 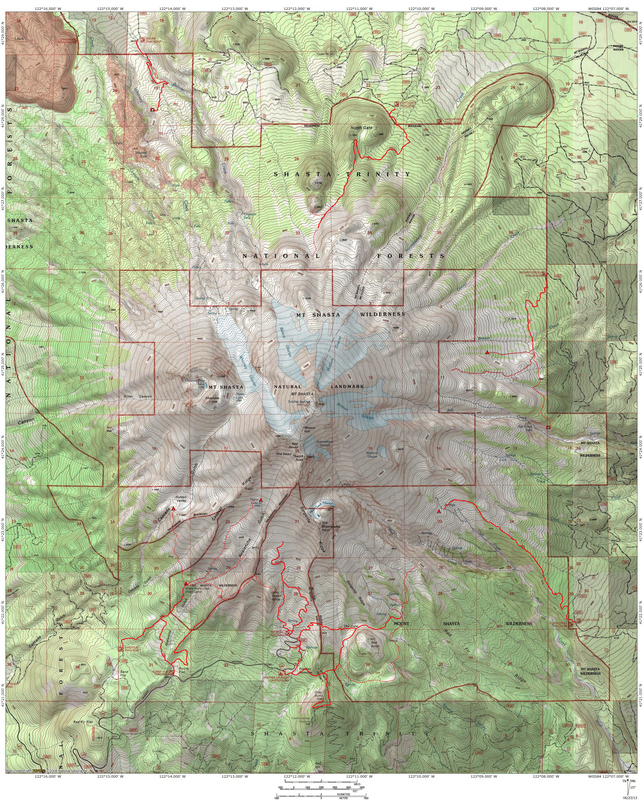 Those that have completed it passed through some of the most isolated country in the Mount Shasta area. Still, it is a wonderfully diverse trip, made the more dramatic by the unknown quality the trail has. It is many things with many pretty sights but at its heart, it is a descent into mystery. That is perhaps the trail’s greatest attribute. The land is beautiful, rugged and wild but the attraction of the unknown enhances these attributes. Though well plotted by cartographers, it is a dark spot on most hiker’s map, despite lacking formal wilderness designation. Perhaps in the near future, this trail will traverse an area protected in its primitive state so that those who seek a land seldom seen will be assured that the SCT retains its secretive allure. Thanks again for all the hard work on your website. I find myself coming back to it time and time again and have finally realized the depth of your site. It truly is a one stop shop. Kathy and I and two seniors citizens hiked the two lower sections of Sisson-Callahan from North Fork to the base of Mt Eddie a few weeks ago, one section each week. The trail was worked on by some boy scouts a while back and is still in very good condition. There was a pack train of at least 4 animals several hours ahead of us. The section we found to be stunningly beautiful was the upper section of the trail from the Morgan Meadows road to the base of Mt Eddie. The river was much more accessible from this section of trail, usually only have to drop down a 2 to 6 ft embankment to access the water for ourselves and our dogs, than the lower section of trail ( from North Shore Rd ) where the river can be significantly lower than the trail and not easily accessed. The trail was a little steep in spots but never for any great length.The forest was lush with open meadows and plenty of open vistas across the canyon. The trees we typical higher altitude in appearance with many old growth beauties with singular twists and gnarls and evidence of the really tough environment that these trees thrive in. The entire hike there and back was around five hours, and that was really taking our time since we had two 80 plus seniors with us. We stopped along the way for pictures of the many wild flowers and of course having Velma Nile with us she was able to identify 99% of them. Even with good cameras one cannot capture the beauty this trail offers. I would suggest this hike for anyone who wants to spend a morning or afternoon seeing a unique section of the Sisson-Callahan Trail. A 5 out of 5 star rating.